Below the beautiful desert sky, near the mountains, along the Sea of Cortez, Palmilla offers a wealth of residential ownership opportunities. Established by Del Mar Development next to the original Palmilla Hotel, they first created the world-renowned Villas Del Mar community. Then, after great success, Del Mar Development built Espiritu, now Los Cabos’ most exclusive private residential, resort and beach club community. After that, they went on to build more communities that you'll see next. Check out Palmilla has everything you need for fun in the sun with a splash of pure elegance, to read about all the area has to offer. Villas del Mar brings together thoughtful design, upscale amenities, and superior property management. And, when you consider who is behind these luxury residences, it is not surprising the level of care and detail that has gone into them. Located near the original Palmilla Hotel, now called One&Only Palmilla, Villas Del Mar at Palmilla has it all! There, you can escape to a place of complete privacy and luxury. It's located in a secluded community overlooking the Sea of Cortez. And, they're built with the finest construction, craftsmanship, architecture and landscaping imaginable. Oceanfront Villas - Comes in three, four, and five bedroom options. Oceanview Villas - Comes in three, four, and five bedroom options. Espiritu Estates - Comes in three, four, and five bedroom options. Las Terrazas - Comes in three, four, and five bedroom options. Las Casitas - Comes in three, four, and five bedroom options. Villas at La Montaña - Comes in three, four, and five bedroom options. Las Haciendas - Comes in three, four, and five bedroom options. Las Entradas - Comes in three, four, and five bedroom options. Club Casitas - Comes in three, four, and five bedroom options. Custom Homes - Placed along a 27-hole Jack Nicklaus Signature Course, these come in five, six, seven, and eight-bedroom options. Select from traditional estate homes, single-family club homes and condominium residences at The Ledges. All residences offer indoor/outdoor spaces and upscale finishes. Luxury living in Los Cabos doesn’t get any better than this! Here, you'll find your last opportunity to own within the elite gate-guarded La Caleta neighborhood, defined by its many cove beaches on the Sea of Cortés. Available lots feature unobstructed views of Palmilla Bay, Punta Gorda, One&Only Palmilla resort and the quaint town of San José del Cabo. These premiere estate-sized home sites are poised on a cliff-side, overlooking a pristine, white-sand beach and the crystal clear waters of the Sea of Cortez. At the northernmost tip of Palmilla, Oasis Palmilla is a gated community overlooking the Palmilla Golf Club, featuring lush desert landscape rolling hills and breathtaking views of the Sea of Cortez. Located on the fifth fairway of Palmilla Golf Club's Ocean Nine is a unique collection of custom home sites known as Oceano Alta and Oceano Baja. Within walking distance of the exclusive One&Only Palmilla, these centrally-located neighborhoods offer a secluded, white-sand swimming beach nearby and lush fairway views. 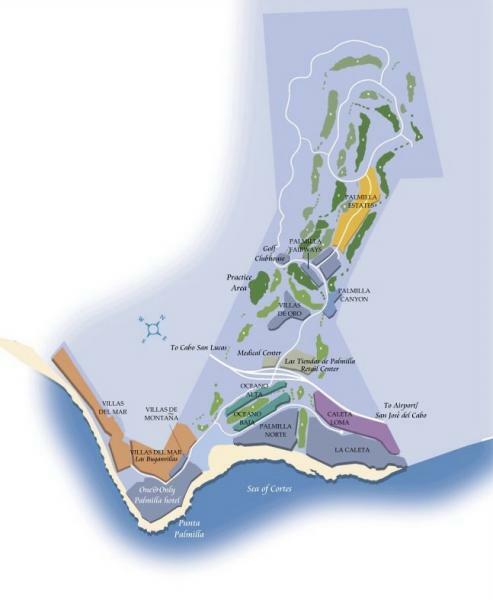 This is a limited collection of custom home sites that overlook the second hole of Palmilla Golf Club's Ocean Nine. These custom-home sites offer spectacular views of the natural arroyo - many featuring impressive ocean views. 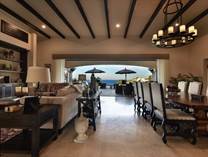 Just steps to the beach, this community is one of the most exquisitely located properties in Palmilla. And, it's close to the famous One&Only Palmilla. Palmilla Cove is one of the most exclusive communities offered in the Palmilla enclave. The Palmilla Estates community offers two-story building options, maximizing home value while still preserving the remarkable fairway, ocean, mountain and sunset views. Here, you'll find a collection of twelve single family homes and home sites in one of the most desirable locations in Los Cabos. In addition to proximity to the world-class Palmilla Golf Club, Pamilla Fairways boasts breathtaking views of the Sea of Cortez combined with a natural arroyo. And, the neighborhood is within walking distance of the Palmilla Tennis Club and Las Tiendas shopping center. Palmilla’s first multi-family community, this neighborhood sits prominently just above the One&Only Palmilla, offering stunning views of the Sea of Cortez. Also, it consists of 14 two and three-bedroom units and a master pool area. Villas de Oro is a masterful collection of luxury condominiums and town homes build along the Jack Nicklaus Signature Golf Course. It offers an incomparable array of privileges and amenities. As an owner, you're a member of the award-winning 27-hole Jack Nicklaus Signature Golf Course, and you have access to the legendary, five-star One&Only Palmilla hotel. Today, the resort maintains the classic Mexican ambiance which has made it a favorite among an international "who’s who" since its original opening in 1956, while expanding and recreating the legendary property for a new generation of travelers. "SEA OF CORTEZ & PALMILLA GOLF COURSE"
Lot Size 12244 sq. ft. Lot Size 1541 sq. m.
"PALMILLA GOLF AND MOUNTAIN VIEWS PEEK A BOO OCEAN VIEW"
"Golf, Mountain & Ocean Views"
"Entry Level Price for Palmilla!" Lot Size 1415 sq. m.
A unique blend of Desert, Mountain, and Ocean views for the ultra-exclusive homes, villas, and custom homesites showcased along a 27-hold Jack Nicklaus Signature Course.